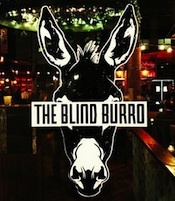 Service is smart and hospitable, allowing The Blind Burro to remain just what it’s meant to be — whimsical and relaxed. This place is all about fun and intelligent spins on well-known Mexican favorites. The menu is stocked with a plethora of shared plates and entrees. They're offering up mole sauces, cotija cheese, pepitas, chilies, and — yes! —a salsa flight. Monday 3-6pm: $4.50 Buena Cerveza bottles, $5 wine and wells, $6 house margarita. $4.50 fish taco, TJ dog with fries, $6 bacon-wrapped jalapenos, $7 Queso Crisp. Tuesday 3-6pm: $4.50 Buena Cerveza bottles, $5 wine and wells, $6 house margarita. $4.50 fish taco, TJ dog with fries, $6 bacon-wrapped jalapenos, $7 Queso Crisp. Wednesday 3-6pm: $4.50 Buena Cerveza bottles, $5 wine and wells, $6 house margarita. $4.50 fish taco, TJ dog with fries, $6 bacon-wrapped jalapenos, $7 Queso Crisp. Thursday 3-6pm: $4.50 Buena Cerveza bottles, $5 wine and wells, $6 house margarita. $4.50 fish taco, TJ dog with fries, $6 bacon-wrapped jalapenos, $7 Queso Crisp. 6-10pm: $17 bottomless margaritas. Friday 3-6pm: $4.50 Buena Cerveza bottles, $5 wine and wells, $6 house margarita. $4.50 fish taco, TJ dog with fries, $6 bacon-wrapped jalapenos, $7 Queso Crisp.